D.C. personalities perform the internationally acclaimed play at GW. A decade before Malala Yousafzai crusaded for girls’ right to education, Mukhtar Mai walked into a police station in Pakistan and said four men had gang raped her on the orders of a tribal assembly. The attackers targeted her as retribution for a crime she said her brother was wrongly accused of committing. Her story is one of seven harrowing narratives told in the play “Seven,” the internationally acclaimed production performed at the George Washington University Monday night. The documentary play honors a diverse group of women who have fought for social change in their home countries. Monday’s performance—sponsored by the Global Women’s Institute and directed by Theatre Professor Leslie Jacobson—featured an impressive cast of prominent Washington, D.C., personalities including NPR’s Susan Stamberg, Federal Communications Commission Chairman Tom Wheeler and Björn Lyrvall, Sweden’s ambassador to the United States. U.S. Army Col. Litonya Wilson, the deputy director for the Department of Defense Sexual Assault Prevention and Response Office, read the part of Ms. Mai. Ms. Mai went on to build several schools for girls in Pakistan and now heads her own organization, which advocates for free and equal education for all in her country. “Seven” is based on interviews with seven women in the Vital Voices Global Partnership, a D.C.-based nonprofit that trains and empowers emerging international women leaders. Written by a group of seven playwrights, the play premiered in 2008 but has since been performed in cities around the world. “Tonight is extremely special, because, yes, we have been to Bollywood, and we have been to Hollywood, but to be back in Washington, D.C., is really powerful,” said Vital Voices President Alyse Nelson before the start of the show. On a bare stage in front of a sold-out Betts Theatre audience, cast members rose in front of their black music stands to give first-person accounts of their characters’ path to social justice. Rather than told in a linear pattern, the seven stories started, stopped and picked up again throughout the play, weaving in and out of one another. Though connected by the central theme of human rights activism, each woman’s tale of courage and strength differs dramatically from the next. Mr. Wheeler played the role of Inez McCormack, a Protestant woman from Belfast who married a Catholic and began her campaign for social justice. John Podesta, chairman of the Hillary for America Campaign Committee, read the role of Farida Azizi, an Afghanistan refugee worker who promotes peace building in her home country. While working as a researcher for the Russian Academy of Sciences in the early ‘90s, Marina Pisklakova-Parker received a survey response that would change the course of her career. It described a woman whose husband had beaten her. When she told two other mothers at her son’s school about the domestic violence, they shrugged their shoulders at the foreign phrase. Realizing that these women had no one to turn to, Ms. Pisklakova-Parker founded the country’s first domestic violence hotline. “I call it a trust line because all the women can do is trust,” Amb. Lyrval said. The readings were sometimes heartbreaking, but the play ended with a standing ovation from the audience and an inspiring message of hope: One person can make a difference in the lives of thousands, no matter the odds. The two days of human rights events continued Tuesday with the 2015 Open Square Summit, an event hosted by GWI and Futures Without Violence. The conference, held at Carnegie Library, guided attendees through the challenges girls and women face throughout their life related to preventing violence and accessing quality education. Tuesday also marked the premiere of “D.C. Seven,” a spinoff of “Seven” created by Dr. Jacobson. 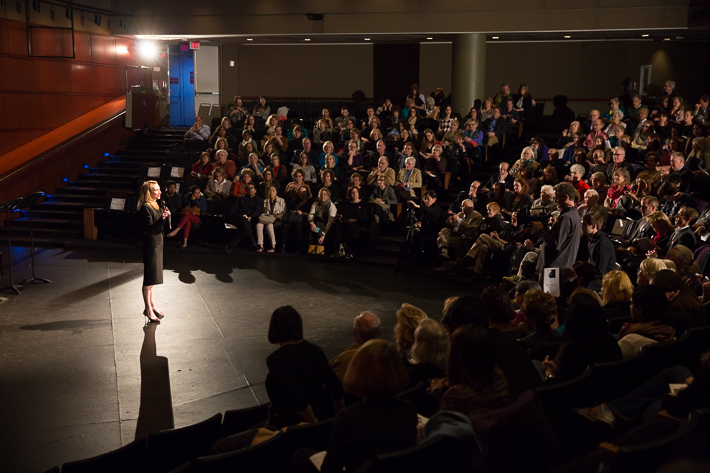 The play—which focused on how women become change agents—featured performers from university and local organizations, including Identity, the Jewish Coalition Against Domestic Abuse, Sasha Bruce Youthwork, Street Sense, Tahirih, FAIR Girls and GW’s Students Against Sexual Assault (SASA).